Begins "琴之首曰鳳額....The head of the qin is called the phoenix forehead...."
One line for each string, beginning "一絃屬土，主宮，為天，為君，其色黃...."
Begins "凡彈琴調弄句度...."; ends "....絕此十二則妙矣 it would be good to avoid these 12 faults"
A list of five, the first being, "凡宮聲和平深厚粗大其音雄洪含通然...."
The list is followed by an essay (straddline QQJC I/86-7) that begins, "琴太古樂也。正聲之所自出...." It is not clear whether it belongs together with the list it follows, or in fact what if any connection it has with the preceding several sections. A somewhat revised version of these nine, as included in Gao Lian's Eight Discourses on Living, is translated by Pei-You Chang on her website. As for playing qin there are three kinds who do so in a common manner: those who in their hearts have no virtue, those who on their face have no moustache (i.e., females and young males), and those who in their bellies have no ink (i.e., they have no taste for literary pursuits). 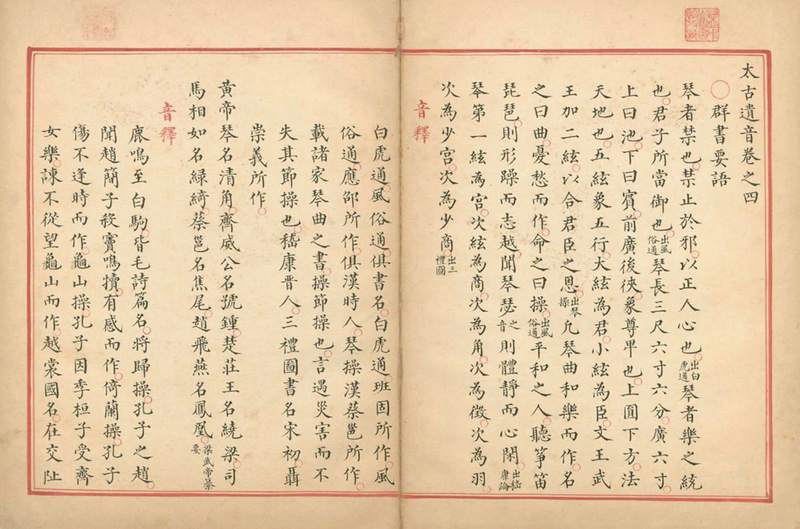 1 See the Comment on the different editions: the original of this chapter is in the Taiyin Daquanji reprinted in QQJC Vol. I, pp. 80 - 88 (70-78 in earlier edition). It is nearly identical to the same passage as reprinted in QFTGYY, pp. 74 - 84, with the latter adding punctuation. It should be noted that the meaning of a number of passages still eludes me. The text here seems to be much the same as that in Taiyin Daquanji, and is much easier to read.